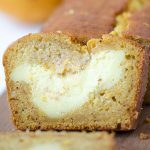 STRAWBERRY CREAM CHEESE FILLED BANANA BREAD – one of the best breads you will ever make! 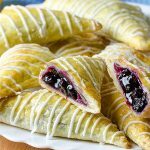 Perfect for breakfast, snack and dessert! Strawberry Cream Cheese Filled Banana Bread is quick, delicious and easy to make. 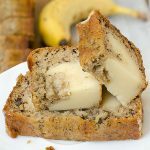 If you looking for the perfect homemade Strawberry Cream Cheese Filled Banana Bread recipe, this is it! 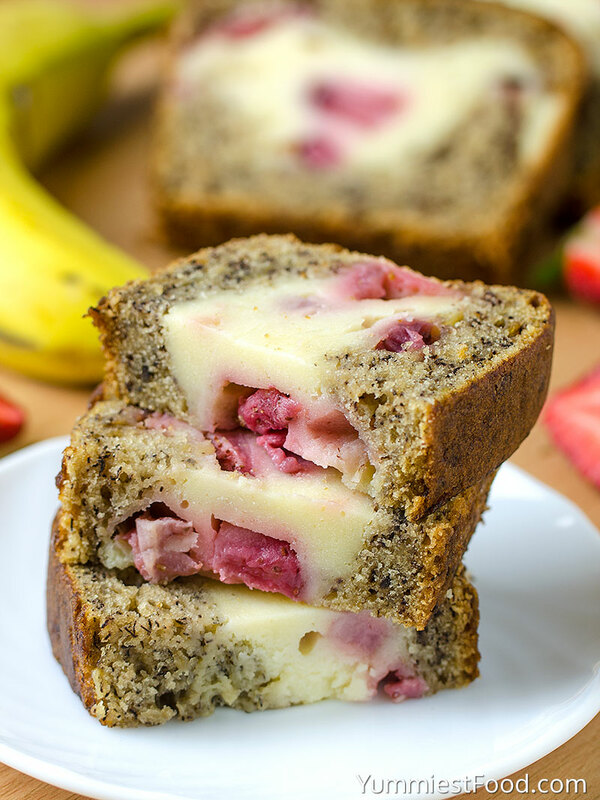 Moist Strawberry Cream Cheese Filled Banana Bread that can be made in a loaf pan. 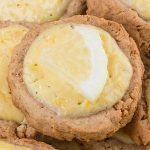 Simple ingredients and easy instructions make this recipe a must try for breakfast or dessert. 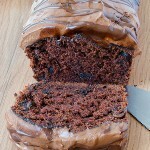 I’m not sure I’ll ever want to eat regular banana bread again after eating this. This is a sweet treat you will most definitely want to make. Fresh strawberries are starting to come into season and make me dream about strawberry dessert and all the different ways to enjoy delicious strawberries for breakfast, lunch and dinner. I used my recipe for Cream Cheese Banana Bread as the foundation. The house smelled irresistibly delicious with aroma of baking strawberries and banana bread wafting in the air. 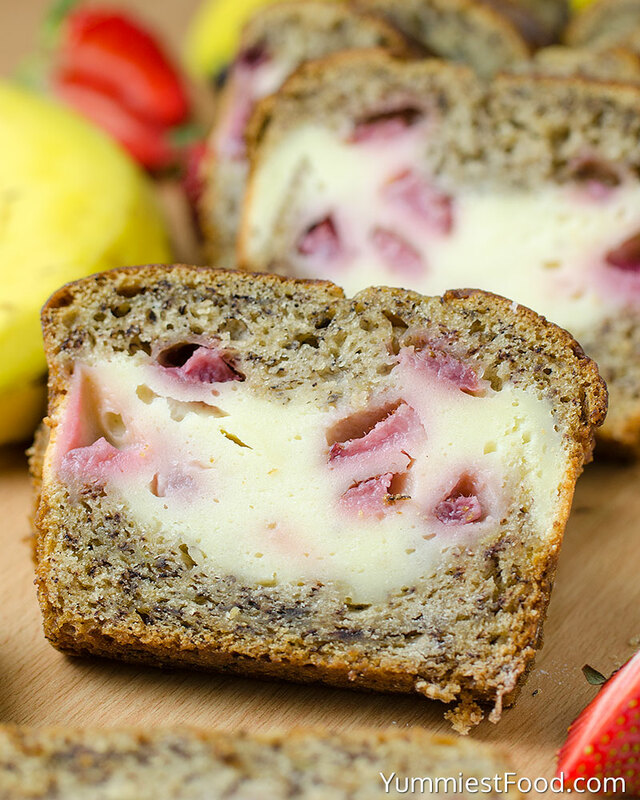 This Strawberry Cream Cheese Filled Banana Bread recipe is incredibly delicious. Quick bread recipes are some of my absolute favorites, since they can be whipped up in no time at all and they usually incorporate common ingredients I almost always have on hand. It’s very tasty and sweet and perfect way to start your day. This recipe is ideal to use bananas with dark spots, when children don’t want to at them. I made this bread so many times and I can say that it is very tasteful. 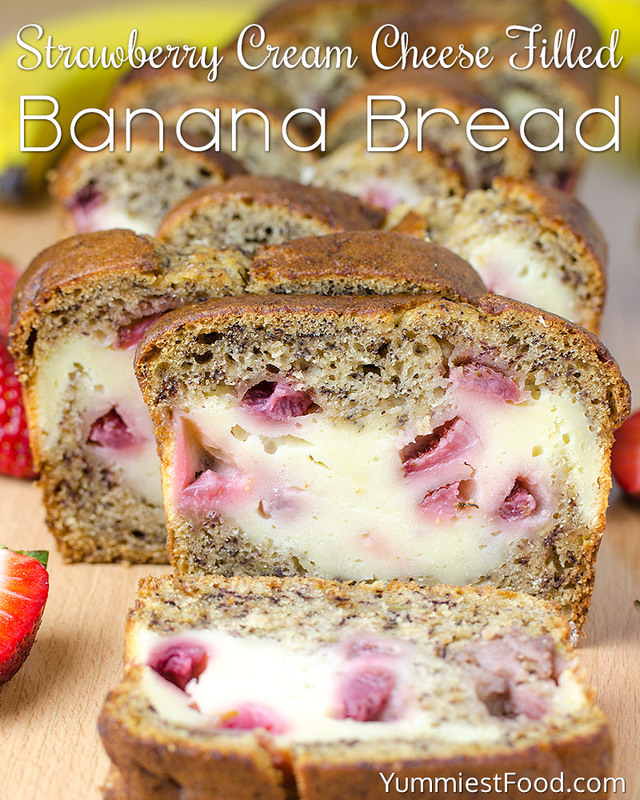 This combination of strawberries, cream cheese and bananas make this bread absolutely delicious. You can freeze it too, but I don’t have that chance because every time I made this Strawberry Cream Cheese Filled Banana Bread it disappears from plate for a short time. 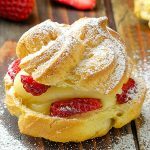 I highly recommend baking this Strawberry Cream Cheese Filled Banana Bread recipe variation while fresh strawberries are in season during late spring and early summer. Enjoy! STRAWBERRY CREAM CHEESE FILLED BANANA BREAD - one of the best breads you will ever make! 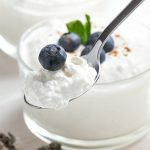 Perfect for breakfast, snack and dessert! Strawberry Cream Cheese Filled Banana Bread will keep airtight in the refrigerator for up to 5 days or in the freezer for up to 6 months. 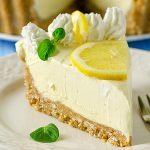 Sour cream may be substitute Greek yogurt and vegetable oil may be substitute with canola oil or coconut oil.